4. Cut the meat into strips before serving. Recipe from the August 8, 2018 New York Times. What sold me was it saying that you can under-cook the pork (145 F). I made it for the boys' 24th birthday BBQ at their house in Pacific Beach later that same day - and a couple of times since. 1. 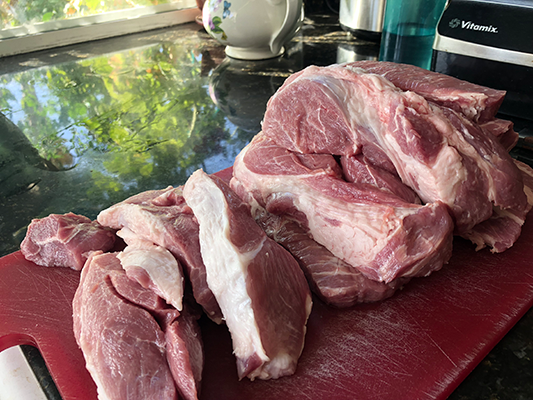 Cut pork shoulder into 1" steaks. 2. Salt and pepper the pork steaks. 3. Mix together the fish sauce, lime or lemon juice, brown sugar, chili and garlic - stirring to make sure that all the sugar gets dissolved. 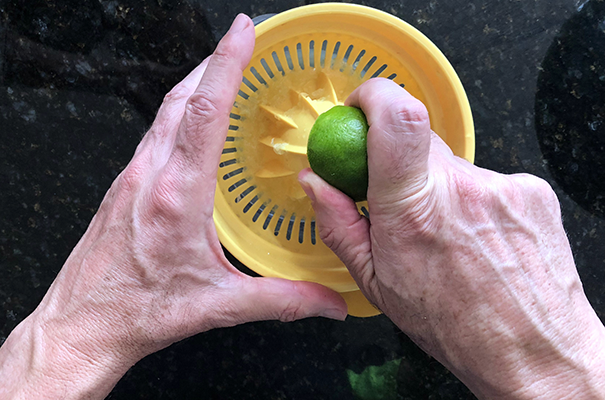 You will need 5 or 6 limes. You can substitute another citrus like lemon or even orange. 4. 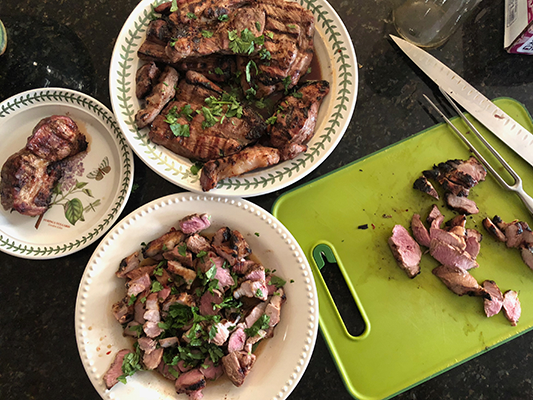 Place the steaks into a shallow glass tray - or perhaps those zip lock bags - and tip in HALF (or two-thirds) the marinade. 5. 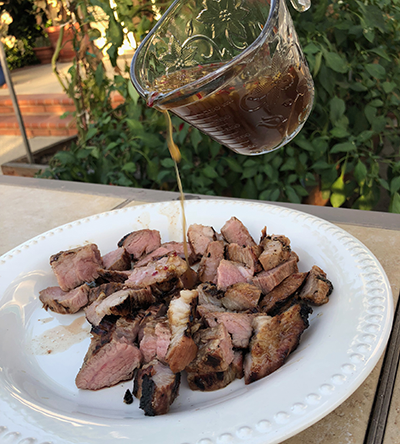 Allow the meat to marinate for as long as you can - ideally overnight, or the whole day, or an hour or two. Then light your BBQ! 6. 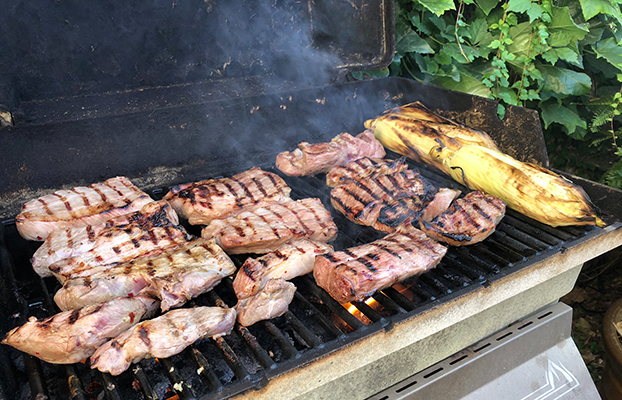 Cook the pork on your BBQ - hot and fast - until it is close to medium rare (145F or 63C according to USDA). 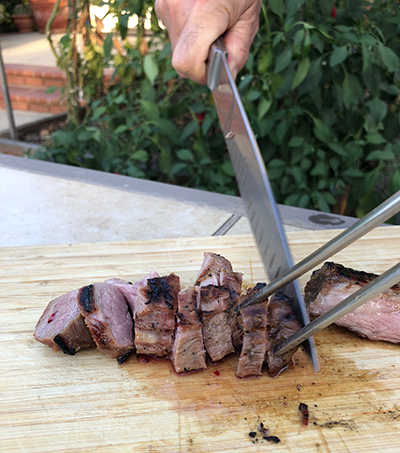 On my BBQ, with 1" steaks, it takes about 10 minutes, turning twice. 7. Let the meat "rest" under aluminium foil for 5-8 minutes or so then slice across the grain. 8. 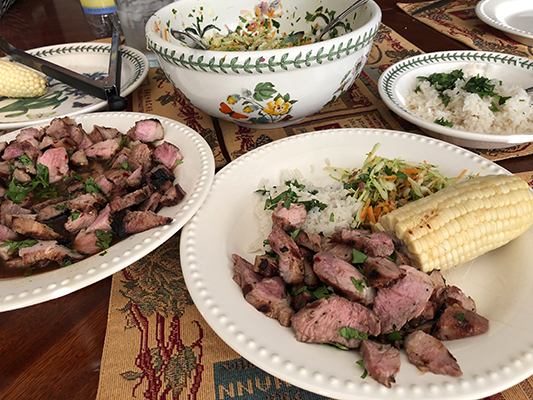 Place the meat on your serving plate then pour over the remainder of the marinade you set aside earlier (not the stuff that touched the raw meat). 9. We like to serve with rice and a coleslaw or other salad and mix it all up on our plate - maybe some corn too.